FxShareRobots.com develops automated forex trading software for the MetaTrader platform. FxShareRobots.com's MT4 EAs include Hedge/Channel Trading system v2.0, Dynamic Trader v1.1, Market Tracker v1.2, ect..for online currency trading. 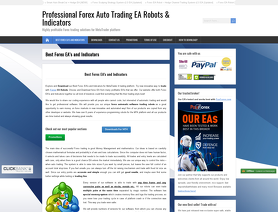 The FxShareRobots.com forex robots are able to trade with any time frame and any currencies pairs as well as stocks, metals etc..
i totally agree with the 2 reviews above ,these eas are pure scams ,they can't make you earn money,i tried it with different settings i just lost money.When you ask for a setfile or tell them about a bug or something wrong with the ea ,if you're lucky you'll get an answer,but it's always gonna be your fault...Don't buy. They are kind with you and full of advise before you buy ,once you pay,they don't give a s..t for you. Hi. This company is a total scam. They cannot provide any details on how their EA's work but when you lodge a complaint then they hide behind their terms and conditions. Shocking. pls be warned and dont buy their products. FXSHAREROBOT TOTAL SCAM, FRAUD, FAKE, NON-SENSE EA! !